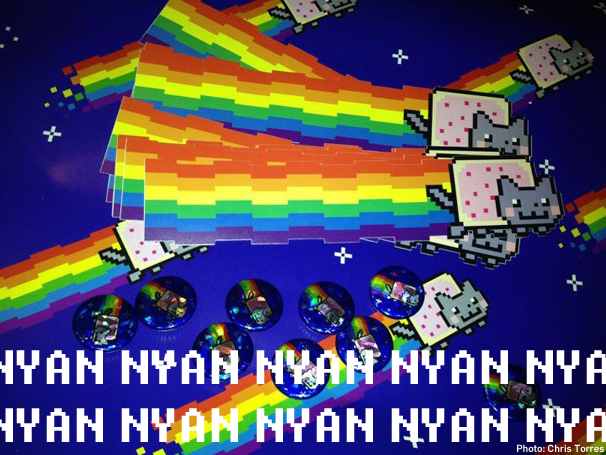 Everywhere you look on the Internet, if you aren't bumping into a lolcat, you might come across a variant of Nyan Cat. For those who have avoided YouTube and social networks for the past year, Nyan Cat is an animated cat that flies through space, wears a Pop Tart, and emits a rainbow trail. For hours. Days. Weeks, even, if you let it. The cartoon is paired with a repitive high-pitched tune, involving just the word "nyan". Yes, very strange. Yet also very cute and very awesome. Oh, and it's extremely popular--it was one of YouTube's most watched videos of 2011. Since its first appearance in April 2011, Nyan Cat now appears on merchandise, DIY costumes, and progress bar hacks, and it's all thanks to Web comic creator, Chris Torres--or as he is better known online, PRGuitarman. GeekTech caught up with Chris to discuss his comics, the creation of that eight-bit cat, and all things memes. 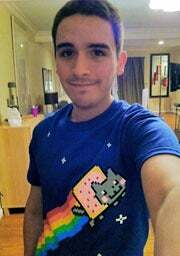 Chris Torres and Nyan Cat! GeekTech: You draw a lot of comics and create gifs on your website. How did that come about? Chris Torres: My drawing hobby actually goes back to when I was in middle school. My friends and I would always be in different classes so we would draw silly notes or comics and exchange them in the hallways as a means of communication. By the end of high school we had created a small cast of characters based off of real people or inside jokes. By tradition, most of our comics were done in 4 square panels so we had to learn how to create comics that would fit big stories into such little space while still making sense and being humorous. I continued making comics after high school and eventually created a LiveJournal dedicated to them. During that time, I was given an image animating program and a tablet (I would use a mouse and MS Paint before this) and it increased the quality of my work greatly. Eventually, I migrated my LiveJournal to PRGuitarman. Other than web comics and Nyan Cat, what else do you get up to in daily life? "It’s always fun being one of the first few thousand people to find a growing new meme and help spread it on the web." I enjoy keeping up with new things that are humorous on the Internet, mostly. I usually check out Reddit and a few other websites almost hourly and share funny or interesting media on Twitter or Facebook. It’s always fun being one of the first few thousand people to find a growing new meme and help spread it on the Web. I’d say most of my inspiration comes from real events, animals and people in my daily life. There are actually a lot of comics on my site that may seem totally out of this world, until you see the photographic evidence. For example, I used to work in a very-low-budget hotel and was subjected to many terrible events that no normal person should go through. To keep myself from going crazy I made a long series of comics about unusual work days and they were a surprising hit! It was a great way to vent my frustrations, and laughing about your problems is always better than getting upset about them. That in mind, where did the inspiration for Nyan Cat come from? The basic idea and inspiration for Nyan Cat was based off one of my most favorite video game stages. In the stage, a very happy-go-lucky character is taking a stroll through space to an upbeat song. My main goal was to create a character with the same joyful vibe. I wanted something that was not only positive and carefree, but that would make the viewer smile and be happy while watching it as well. I decided on pixel artwork for the actual animation because there’s something nostalgic and powerful about creating things out of pixels. It was also a fun challenge to make the GIF work correctly. Why did you choose a cat? Do you think Nyan cat would have worked if it had started with another cute pet? The choices of a mix between a Pop Tart and a cat were actually a totally random occurrence. In late February, I was taking part in a little charity event for [my] website. Basically, I’d draw things that people suggested for contributions and all proceeds went to the American Red Cross (to this day, I’ve raised a little over $8,000 total for different organizations, including Child’s Play and Doctors without Borders). As things slowed down near the end of the event, I came up with the original design. Marty, the driving force behind Nyan Cat. 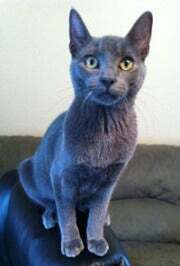 The cat itself was based off my very own mischievous cat, Marty (as in Marty McFly from Back to the Future). Marty has been the star of many of my comics. I reached out to my friend Brandon Green to create a website dedicated to Nyan Cat based on that idea. Basically, all you do is watch Nyan Cat fly across the screen in tune to the music for however long you can handle it. You can choose a number of different versions of Nyan that all have their own special musical accompaniment. People seem to really enjoy it! So Nyan Cat was kind of an accident, but what made you think a pop tart and a cat plus rainbows would blend so well? Haha, this is honestly my favorite question because of just how random its creation was. A little background on this, that night I was drawing commission doodles for people on Livestream for The American Red Cross but not many people were contributing. 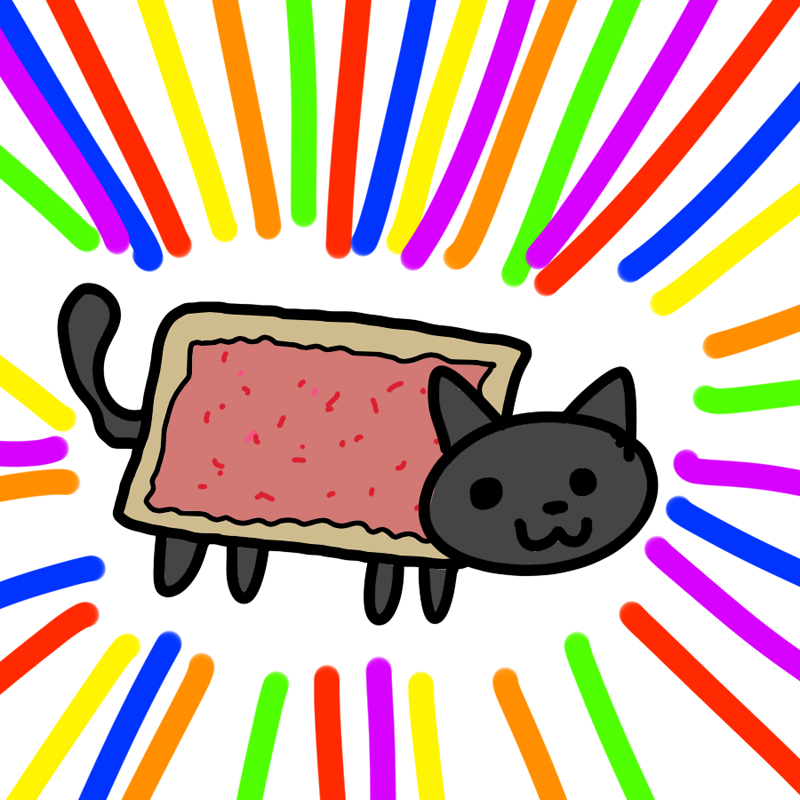 I began drawing random things for my own benefit, when two different people suggested I draw "a pop tart" and "a cat". It was honestly just a split-second decision to combine the two, much to the delight of everybody in the chat room. Where did the term "nyan" come from? "Nyan" is originally the Japanese term for "Meow". Sara ("Saraj00n" on YouTube) was the one clever enough to combine Daniwell’s song with my image, and coined the term “Nyan Cat”. I think it’s very fitting! What were you expecting when you first uploaded the Nyan Cat GIF? It became one of the most watched videos of YouTube in 2011, and people dress their cats up like it too! I had absolutely no clue the impact on the Internet my GIF would have created. It was only meant to be an avatar for my Twitter account and nothing more, but the other day it blew my mind when I found out it actually got a good amount of coverage on January 2012’s TIME Magazine issue. Seeing now that it beat out millions of other videos for the number five spot of 2011 is such a thrill, and it’s so exciting to know that people around the world find joy in my work. I now actually have a Facebook page dedicated to everything that is Nyan Cat, and it’s getting difficult keeping up with all of the fan photos sent in. There are tons of variants of Nyan Cat on YouTube now; which one is your favorite? Then there’s the fact that almost every country on this planet has their own Nyan Cat, or that people get in costumes, grab their own cats, or write entirely new and professional music videos about Nyan Cat. It’s so crazy! But to answer your question, if I really had to choose, I’d go for this real life Nyan Cat video [embedded below]. This version always makes me laugh. That cat looks so chilled and cool during what he’s going through, and it appears to be a Russian Blue [the official name for a cat with a gray coat color] breed, which is the correct Nyan Cat breed. I love it! If you could've created any meme out there other than Nyan Cat, which would you pick (and why)? My vote goes to Honey Badger Don’t Care [Language NSFW]. It was one of my favorite videos of 2011, for sure. I just really like the way the narrator speaks. He’s so sassy and fun and I hear he’s got a cartoon in the works. Good for him! In your opinion, which is the best cat meme out there (other than Nyan Cat)? Oh gosh, this is a no-brainer for me: Keyboard Cat! Keyboard cat is the coolest cat around! Are you going to do anything else with Nyan Cat in the future? Or are you perhaps working on something else…? At this time I’m working to make nyancat.cat a fun experience for Nyan Cat fans. My goal is to have something that stays true to the original formula, but incorporates other ideas for different characters to keep things fresh and fun (via the “choose flavor” button). I already have a few variations of characters with their own Nyan Cat song remixes set for release during different dates of the year. It’s a fun little hobby and I hope people enjoy it as much as I do. Aside from the website, there are definitely some big things on the way for Nyan Cat, but I can’t really talk about most of them right now! I will say though that we're currently working with 21st Games, the studio behind Techno Kitten Adventure, to release the popular "Nyan Cat Adventure" Xbox indie title to mobile devices. I've also been getting offers for some cool things, but I'm pretty selective of what I'm after. I want Nyan Cat to stay cool and relevant to the Internet pop culture, after all! What do you think makes a good meme? "A meme should not be something forced or planned, it should be something original that springs forth onto the web and catches everybody off-guard. " The formula to a good meme honestly varies by situation, but I think the main factor has to be something that people can relate to or have a deep sense of emotion for. Another big factor I believe in is that a meme should not be something forced or planned, it should be something original that springs forth onto the web and catches everybody off-guard. The internet can smell a forced meme from a mile away, too. It all just comes down to getting a lucky break or having a good public reach to get the idea out there, and then just letting the internet do its magical work. Other than Nyan Cat, what is your proudest work? I’d say my most proudest work from my comics has to be my “Most Perfect Day Ever” strip. It’s become a meme of its own and was even featured on G4TV’s Attack of the Show. That was the first time anything I created went viral like that, it was such a great feeling. Do you have any tips or advice for people making comics or gifs? Do whatever you do only because you love doing it, and make sure you keep it fun!